A covered litter box offers a range of advantages: the litter no longer ends up strewn all over your home. Your cat feels totally at peace in this den-like litter box. And most importantly, it locks in nasty odours, which is further boosted by active carbon filters. In sleek, shiny black and light cream, this litter box looks great in any home. The stable covered litter box comes with 2 active carbon filters and a rub-free swing door made of transparent black plastic. The swing door just hangs down and can swing in and out. If your cat is not used to a swing door, you can help it slowly become accustomed to it. Start off by unhinging the swing door until your cat is used to the covered litter box. Then you can reattach the swing door a few days later and show your cat how it can open the door with a nudge of its paw or head. You will see how quickly your cat catches on. A practical handle is built into the lid of the litter box, making it easy to carry around. The filters should be changed regularly to maintain that odour-destroying power of the litter box. 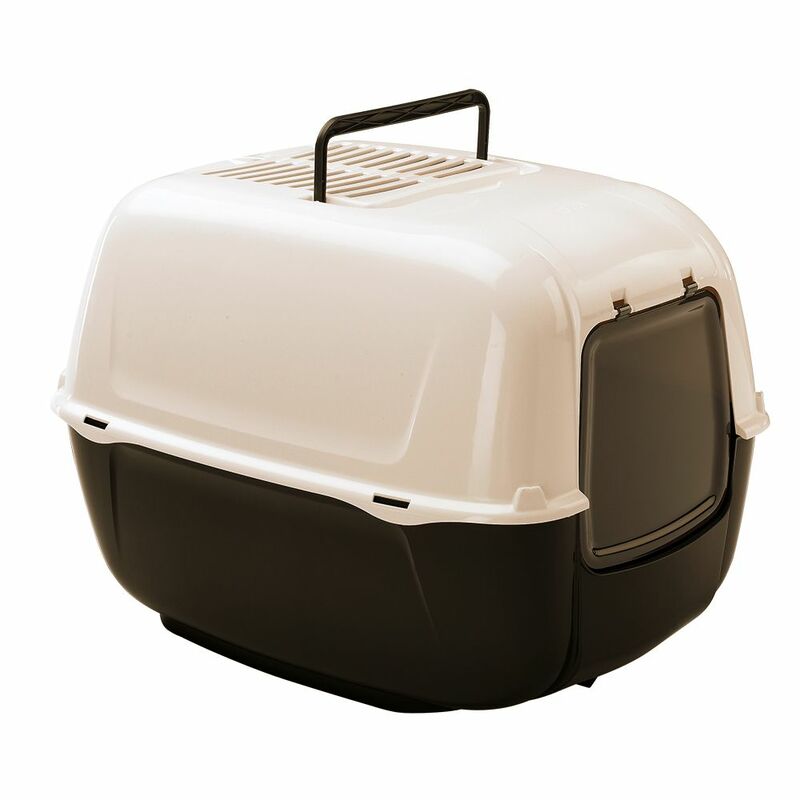 Ferplast Maxi Bella Litter Box at a glance: Colour: Base tray: black (shiny) Lid: light cream (shiny) Swing door: transparent black Comes with 2 active carbon filters With a swing door With integrated handle grip on lid Made in Italy Size: Total: 52.5 x 39.5 x 38 cm (L x W x H) Swing door entrance: approx. 20 x 19 cm (W x H) Base tray height: 19cm Entrance height: 12cm Ferplast - Quality produced in Italy: The traditional Italian brand Ferplast has been producing high quality pet acceΒories for over 40 years. New Pet Generation means maximum comfort and top product quality for all pets. Universal Active Carbon Filters (x3): Click on product number 279574.3 to receive 3 universal active carbon filters. Their initial size is 20 x 15 x 0.4 cm (LxWxH) but can be cut down to the desired size. When buying replacement carbon filters for this litter box, the filters come 3 to a pack.